DWT was established in 1998 and is modeled after the Wolf Trap Institute for Early Learning Through the Arts program in Vienna, Virginia. DiAE is one of sixteen affiliates nationwide. 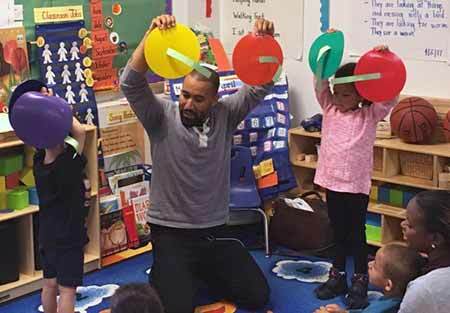 The DWT residency is a partnership between a Wolf Trap Teaching Artist and an early childhood educator to provide professional development for teachers while helping children learn through active participation. 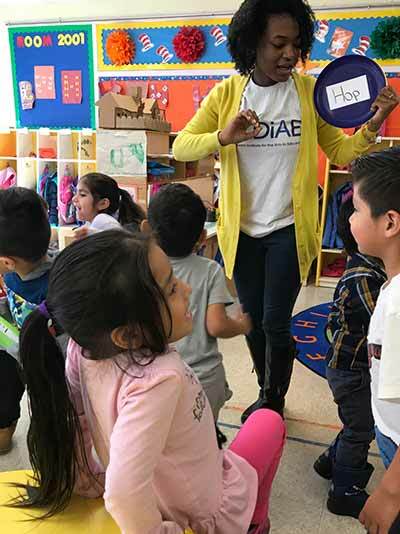 Classroom experiences in a DWT residency focuses on performing arts-integrated strategies to promote literacy and STEAM (science, technology, engineering, arts & math) development that teachers can use to foster young children’s learning and development. Classroom experiences in the residency will support early childhood curriculum standards and outcomes. “As a preschool teacher with NCC Head Start, I had the tremendous opportunity to work with Mr. George and the Delaware Wolf Trap program. I can attest the children looked forward to the visits every week. They consistently participated and enjoyed every lesson. As a teacher I was able to incorporate several ideas into the classroom including the number counting book. Whenever we read a book in the classroom that had multiple characters or anything else that could be counted, the children would suggest we use the counting book. Orientation/pre-residency planning meeting: TA and classroom teacher to discuss the residency, the classroom teacher’s background, the students, and the curriculum. Before beginning the classrooms sessions, the TA visits the classroom to observe the classroom. Nine classroom sessions led by the TA: (30-minute sessions). Each session is followed by a 15-minute debrief discussion between the classroom teacher and the TA. Three planning meetings: The TA and the classroom teacher create a lesson plan and fills out the Teacher Experience Planning Form. Two sessions led by the classroom teacher: The TA is present and participating. Resource materials: Access copy of and access to additional resources on Wolf Trap Institute for Early Learning through the Arts website. Parents and caregivers are a child’s first teachers. DWT offers lively, hands-on workshops that encourage imaginative play and arts-based development activities for family members and child care providers. 45–60 minutes.